On 4 November, bubbling, a strong sulfur smell, and micro-telluric tremor were observed in the sea near Panarea Island in the Aeolian Archipelago. The submarine hydrothermal activity killed hundreds of fish. According to Stromboli On-Line, the temperature of the water in the area was not very high (~25°C). They stated that an intensification of degassing and consequent bubbling occurred in the area surrounding the small islet of Lisca Bianca, about 2 km E of Panarea. On 3 November 2002, intense degassing caused bubbling activity near the small islet of Lisca Bianca, very close to the island of Panarea (BGVN 27:10). On 13-14 November 2002, observers Orlando Vaselli (University of Florence), Bruno Capaccioni (University of Urbino), and Piermaria Luigi Rossi (University of Bologna) noted 10 points of boiling water when they visited the area to sample gas emissions. Geochemical monitoring and research is being regularly performed by the Fluid Geochemistry group from the Osservatorio Vesuviano (Istituto Nazionale di Geofisica e Vulcanologia), led by Giovanni Chiodini. Submarine gas emissions were sampled during 29-30 November and 10-17 December 2002, as well as 23-24 January and 9-11 February 2003. Samples obtained during March, April, and May have not yet been analyzed. Chiodini noted that although the intensity of emissions decreased after 5 November 2002 (BGVN 27:10), the gas flux remained much higher than before the November event. That observation, along with chemical variations in gas samples, indicate that the process is ongoing. Research results posted on the Osservatorio Vesuviano website provide additional details, analytical findings, and hypotheses about these phenomena. Information Contacts: Giovanni Chiodini, Unità Funzionale di Geochimica dei Fluidi, Osservatorio Vesuviano, Istituto Nazionale di Geofisica e Vulcanologia, Via Diocleziano, 328-80124 Napoli, Italy (URL: http://www.ov.ingv.it/); Orlando Vaselli, Dipartimento di Scienze della Terra, Universita' degli Studi di Firenze, Via La Pira 4, 50121 Firenze, Italy; Stromboli Online (URL: http://www.stromboli.net/). On 3 November 2002, fishermen reported strong exhalative phenomena in the Lisca Bianca-Bottaro-Lisca Nera area, E of Panarea Island (figure 1). They described boiling seawater, dead fish, and an intense sulfur smell. On 4 November, scientists of the Istituto Nazionale di Geofisica e Vulcanologia (INGV) carried out aerial and sea surveys between Panarea and the Lisca Bianca-Dattilo-Bottaro islets from a Civil Protection helicopter and a Coast Guard boat. Figure 1. Bathymetric map of the Panarea Island area, showing the area of degassing in November 2002. Modified from Gabbianelli et. al. (1990); courtesy of INGV. In three distinct areas between Lisca Bianca and Lisca Nera (figure 2), discolored water was visible, accompanied by intense gas bubbling. The first area, located W of Lisca Bianca, had three distinct degassing points in which bubbles with diameters of some meters reached the sea surface. A second area stretched SSE from W of Bottaro; on the sea surface there was only one point where vigorous outbursts of meter-sized bubbles were noted (figure 3). The third and smallest area was just SW of the second one. Water depths in all three areas are shallower than 30 m.
Figure 2. Bathymetric map and location of degassing points on 4 November 2002. Modified from Gabbianelli et. al. (1996); courtesy of INGV. Figure 3. Aerial photo of the Lisca Bianca-Bottaro-Lisca Nera-Panarea Island area with evident water discoloration phenomena on 4 November 2002. Courtesy of INGV. During the preliminary survey, INGV scientists recorded thermal images of the sea surface. Direct pH and temperature measurements were carried out at different depths, and seawater samples were collected. Neither temperature measurements nor thermal images identified appreciable thermal anomalies, because water temperatures (22-23°C) near the degassing points were similar to those close to the island's pier. Conversely, pH values were about 5.6-5.7, significantly lower than typical seawater values. A field survey was also carried out in the Calcara Beach area, where fumarolic activity has been known since the Roman Age. No anomalies were detected in either the fumarolic flux or in the measured temperature (100°C). Finally, field and aerial surveys were performed in order to exclude the occurrence of ground fissuring or other related anomalous phenomena on Panarea Island. On 5 November the aerial survey highlighted a remarkable decrease in the intensity of exhalation activity and a sharp reduction of the area affected by water discoloration. In particular, gas bubbling was restricted to the area W of Bottaro. Repeated thermal investigations did not find any significant anomaly. Vigorous bubbling and water discoloration further decreased in the following days. Seismicity. In the early morning on 3 November the INGV seismic station PAN recorded a swarm of microseisms close to Panarea. PAN, in the E part of the island, is equipped with a 1-Hz vertical seismometer. Although isolated micro-events were recorded beginning at 0253 GMT, the most intense phase of the swarm, in terms of number of events, occurred between 0337 and 0500 GMT. During the swarm, geophysicists noted some hundreds of micro-events with average durations of 8 seconds and magnitudes generally less than 1. After the climax, isolated events continued. Overall, there were a few events with magnitudes between 1 and 1.5; it was impossible to locate their hypocenters because they were not detected at stations more distant from the island. According to S-P arrival time differences, the source could lay within a radius of 2-3 km from the island. The spectrum of the events analyzed shows a broad frequency content, with dominant peaks from 5 to 16 Hz. Background. Panarea, the smallest island of the Aeolian volcanic arc in the Southern Tyrrhenian Sea, is located ~30 km SW of Stromboli. Panarea is a cone-shaped edifice rising from 1,700 m below sea level to 421 m at Punta del Corvo peak. The subaerial portion of the island was built by prevailing effusive activity and emplacement of domes from 149 to 124 Ka (Calanchi et al., 1999). A second stage, during which pyroclastic activity prevailed, occurred between 59 and 13 Ka (Losito, 1989). As of November 2002 the only volcanic activity consists of a broad fumarolic field in a submarine crater, whose rim is inferred by the semicircular distribution of the islets of Dattilo, Lisca Bianca, Bottaro, and Lisca Nera (Gabbianelli et al., 1990, Italiano and Nuccio, 1991). Panarea and the Aeolian Islands are monitored by the Istiuto Nazioanle di Geofisica e Vulcanologias, Sezz. Catania and Palermo. References. Calanchi, N., Tranne, C.A., Lucchini, F., Rossi, P.L., and Villa, I.M., 1999, Explanatory notes to the geological map (1:10000) of Panarea and Basiluzzo islands (Aeolian arc. Italy): Acta Vulcanologica, v. 11, no. 2, p. 223-243. Gabbianelli, G., Gillot, P.Y., Lanzafame, G., Romagnoli, C., and Rossi, P.L., 1990, Tectonic and volcanic evolution of Panarea (Aeolian Islands, Italy): Marine Geology, v. 92, p. 313-326. Gabbianelli, G., Cortecci, G., Capra, A., Giacomelli, L., Pompilio, M., and Rossi, P.L., 1996, Lineamenti geo-vulcanologici ed ambientali del'area craterica sottomarina di Dattilo-Lisca Bianca (Isola di Panarea, Arcipelago Eoliano) in Caratterizzazione ambientale marina del sistema Eolie e dei bacini limitrofi di Cefalù e Gioia (EOCUMM 95) (edited by Faranda, F.M., and Povero, P.): Data Report, p. 455-462. Italiano, F., and Nuccio, P.M., 1991, Geochemical investigation of submarine volcanic exhalations to the east of Panarea, Aeolian Islands, Italy: Journal of Volcanology and Geothermal Research, v. 46, p. 125-141. Losito, R., 1989, Stratigrafia, caratteri deposizionali e aree sorgenti dei Tufi Bruni delle Isole Eolie: Unpublished Ph.D. thesis, Bari University, 92 p.
Information Contacts: Susanna Falsaperla, Luigi Lodato, and Massimo Pompilio, Istituto Nazionale di Geofisica e Vulcanologia - Sezione di Catania (INGV), Piazza Roma, 2, 95123 Catania, Italy (URL: http://www.ct.ingv.it/en/). The mostly submerged Panarea volcanic complex lies about midway between Stromboli and Lipari in the eastern part of the Aeolian Islands. Panarea, the smallest island in the Aeolian Archipelago, lies on the western side of a shallow platform whose shelf margin is at about 130 m depth. A series of small islands breach the surface to form the Central Reefs, the rim of a crater 2 km E of Panarea, whose shallow submerged floor contains Roman ruins. The submerged Secca dei Pesci lava dome lies at the SE end of the platform, and the rhyolitic Basiluzzo lava dome rises 165 m above the surface at the NE end, along a ridge trending towards Stromboli volcano. The complex was constructed in two main stages: an initial effusive activity phase that produced lava domes, and an explosive stage. The youngest subaerial airfall-tephra deposits are dated to about 20,000 years ago; a date of less then 10,000 BP on a lava flow is uncertain. Vigorous hydrothermal activity has continued at fumarolic fields at several locations on the submerged platform; submarine hydrothermal explosions have occurred in historical time. Calanchi N, Capaccioni B, Martini M, Tassi F, Valentini L, 1995. Submarine gas-emission from Panarea Island (Aeolian Archipelago): distribution of inorganic and organic compounds and inferences about source conditions. Acta Vulc, 7: 43-48. Calanchi N, Peccerillo A, Tranne C A, Lucchini F, Rossi P L, Kempton P, Barbieri M, Wu T W, 2002. Petrology and geochemistry of volcanic rocks from the island of Panarea: implications for mantle evolution beneath the Aeolian island arc (southern Tyrrhenian Sea). J. Volcanol. Geotherm. Res., 115: 367-395. Calanchi N, Tranne C A, Lucchini F, Rossi P L, Villa I M, 1999. Explanatory notes to the geological map (1:10,000) of Panarea and Basiluzzo islands (Aeolian arc, Italy).. Acta Vulc, 11: 223-243. Cimarelli C, De Rita D, Dolfi D, Procesi M, 2008. Coeval strombolian and vulcanian-type explosive eruptions at Panarea (Aeolian Islands, Southern Italy). J. Volcanol. Geotherm. Res., 177: 797-811. Dolfi D, de Rita D, Cimarelli C, Mollo S, Soligo M, Fabbri M, 2007. Dome growth rates, eruption frequency and assessment of volcanic hazard: insights from new U/Th dating of the Panarea and Basiluzzo dome lavas and pyroclastics, Aeolian Islands, Italy. Quat Internat, 162-163: 182-194. Esposito A, Giordano G, Anzidei M, 2006. The 2002-2003 submarine gas eruption at Panarea volcano (Aeolian Islands, Italy): volcanology of the seafloor and implications for hazards scenario. Marine Geol, 227: 119-134. Gabbianelli G, Gillot P Y, Lanzafame G, Romagnoli C, Rossi P L, 1990. Tectonic and volcanic evolution of Panarea (Aeolian Islands, Italy). Marine Geol, 92: 313-326. Gabbianelli G, Romagnoli C, Rossi P L, Calanchi N, 1993. Marine geology of the Panarea - Stromboli area (Aeolian Archipelago, southeastern Tyrrhenian Sea). Acta Vulc, 3: 11-20. Gamberi F, Marani M, Savelli C, 1997. Tectonic, volcanic and hydrothermal featues of a submarine portion of the Aeolian arc (Tyrrhenian Sea). Marine Geol, 140: 167-181. Lucchi F, Tranne C A, Calanchi N, Rossi P L, 2007. 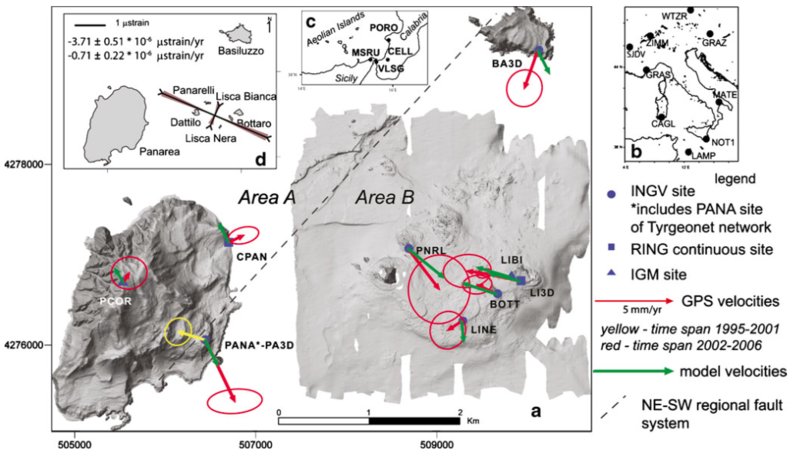 Late Quaternary deformation history of the volcanic edifice of Panarea, Aeolian Arc, Italy. Bull Volcanol, 69: 239-257. Savelli C, Marini M, Gamberi F, 1999. Geochemistry of metalliferous, hydrothermal deposits in the Aeolian arc (Tyrrhenian Sea). J. Volcanol. Geotherm. Res., 88: 305-323. The Global Volcanism Program is not aware of any Holocene eruptions from Panarea. If this volcano has had large eruptions (VEI >= 4) prior to 10,000 years ago, information might be found on the Panarea page in the LaMEVE (Large Magnitude Explosive Volcanic Eruptions) database, a part of the Volcano Global Risk Identification and Analysis Project (VOGRIPA). From: Esposito et al. 2010. Reference List: Esposito et al. 2010. Esposito, A., M. Anzidei, S. Atzori, R. Devoti, G. Giordano and G. Pietrantonio, 2010. Modeling ground deformation of Panarea volcano hydrothermal/geothermal system (Aeolian Islands, Italy) from GPS data. Bulletin of Volcanology, 72, p. 609-621. There is no Emissions History data available for Panarea. Panarea Island in the background is the largest subaerial component of a mostly submarine volcanic complex between Lipari and Stromboli volcanoes. The last eruptions at Panarea took place during the early Holocene, but hydrothermal activity has continued until the present at fumarolic fields at several locations on the submerged platform. 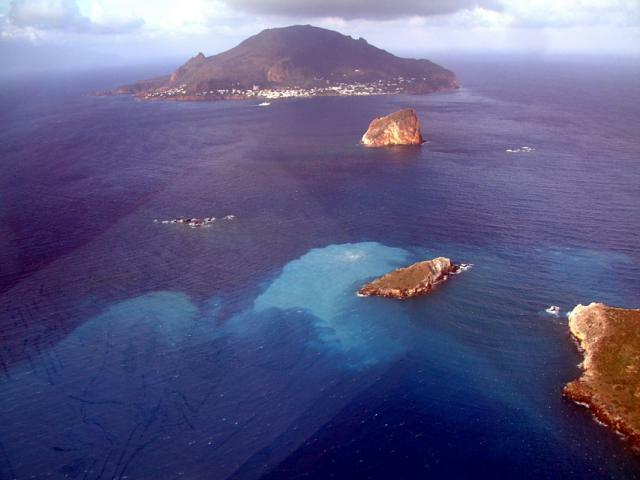 The water discoloration in the foreground, 2 km east of Panarea Island near the small islands of Lisca Bianca, Bottaro, and Lisca Nera, took place during November 2002. Photo courtesy of Istituto Nazionale di Geofisica e Vulcanologia, Sezione di Catania (INGV), 2002. There are no samples for Panarea in the Smithsonian's NMNH Department of Mineral Sciences Rock and Ore collection. Large Eruptions of Panarea Information about large Quaternary eruptions (VEI >= 4) is cataloged in the Large Magnitude Explosive Volcanic Eruptions (LaMEVE) database of the Volcano Global Risk Identification and Analysis Project (VOGRIPA).